Your Website’s URL: An Expensive .com Domain Name … or These Creative Alternatives? One of the hardest financial decisions you’ll face when naming or renaming a company or product is whether you should splurge for the exact .com domain name—and, if not, how you should adapt the URL so that it fits with your brand and allows consumers to easily find your site. 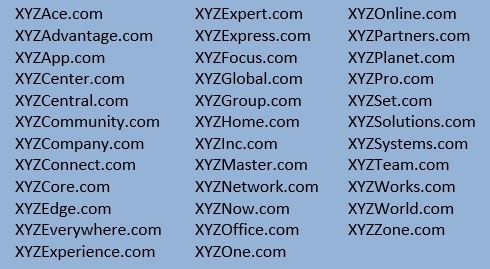 On the one hand, buying an exact .com domain makes finding your website much easier for customers and lends invaluable prestige to your company. On the other hand, purchasing an exact .com domain can be very expensive, especially if you are looking for a real English word. Furthermore, limiting yourself to just exact .com domains will likely exclude names that otherwise would work well for your brand but are simply unavailable for purchase as a domain. Here is my advice for anyone struggling with such a decision. 1. If your company is involved in online commerce, or consumers make transactions through your website, then invest in the exact URL. Retailers benefit from the cachet of an exact domain. Also, you don’t want customers to have difficulty finding you; if they have to google you, they can be potentially siphoned away by ads or other search results. 2. If you are renaming an established company that previously had an exact .com, you should procure the exact .com for your new name as well. Opting for a modified URL in that situation would be a step toward lower prestige and could exacerbate a (fairly unavoidable) period of confusion after the renaming. 3. If you are the sole heir to the fortune of Mrs. Moneybags—or you’re VC-backed—and you have ample funds at the ready, then go for it! You might as well give your company as much of an advantage as possible. If done right, modifying a .com domain won’t inhibit a good company from growing and succeeding. Famously, Dropbox started at www.getdropbox.com, Square started at www.squareup.com, and plenty of companies that never even dropped the modifier—such as Method at Methodhome.com, or us here at CatchwordBranding.com. If this is going to be your approach, first identify modifiers common to your industry, such as “health” or “medical” for healthcare services; using such modifiers will make your website address easier to remember for consumers. Of course, there are plenty of other options; you just need to find the one that fits best with your name in tonality (Inc sounds more corporate, Go is active, Planet is friendly), sound (maybe one is alliterative, or simply more euphonic), and of course, budget and availability. It’s likely you’ll find some options that are unregistered, and some that you would have to buy. Another route you can take for a more reasonably priced domain name is to use a non-.com TLD. Country-code TLD extension, such as .ly (Libya), .co (Colombia), and .me (Montenegro) have become prolific and accepted by consumers in recent years. Some of those extensions will need to be incorporated into your name (Instagram started out as Instagr.am (Armenia), for example), and you probably shouldn’t use a domain with .ly if you don’t want it to be part of your name when spoken aloud. Other extensions, such as .co, can simply replace the .com. As with the modifiers, certain extensions are linked with certain industries; for example, .io (British Indian Ocean Territory) extensions are being used by technology companies, because “io” is shorthand for input/output, and .tv (Tuvalu) is associated with—you guessed it—television or video streaming sites. The danger with using alternate TLDs is that they are trendy, and trends go in and out of style. The .ly extension is already beginning to feel shopworn (Bit.ly is now Bitly.com), and new companies with -ly names can seem uncreative. In the future, .ly domains may feel as passé as .net and .biz. Though consumer acceptance of these nascent domains has yet to be established, the recent enthusiastic embrace of select ccTLDs is an indication that the more intuitive and practical gTLDs will be accepted as well. Finding the right URL can be daunting, but with a little time and effort you can absolutely find a domain that works for your brand—and your wallet!